In We Are the Ones We Have Been Waiting For, Alice Walker, Pulitzer Prize winning author of The Color Purple , draws on her deep spiritual grounding, her passionate political convictions and her extraordinary literary gifts to give us a series of meditations on the universal struggles for wisdom, justice, and peace. We are the ones we have been waiting for, Walker says, because we live in an age in which we are able to see and understand our own predicament. With so much greater awareness than our ancestors – and with with such capacity for insight, knowledge, and empathy –we are uniquely prepared to create positive change within ourselves and our world. In these wise and compassionate personal and political ruminations, Walker considers some of the greatest challenges of our times – ending war, healing the bitter scars of racism and oppression, defending the rights of women, and protecting our fragile ecosystem – and shares her understanding of both the challenges ahead and how all of us can find the inner strength to face them. 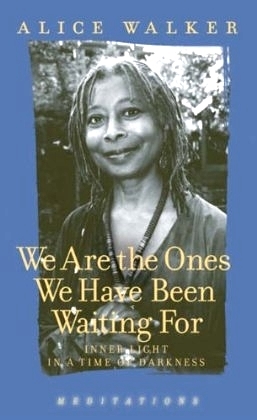 We Are the Ones We Have Been Waiting For is, above all, an extraordinary celebration of our capacity for compassion and clarity, even in the darkest moments, from a lifelong advocate of the dispossessed who is also one of the most important writers of our time.